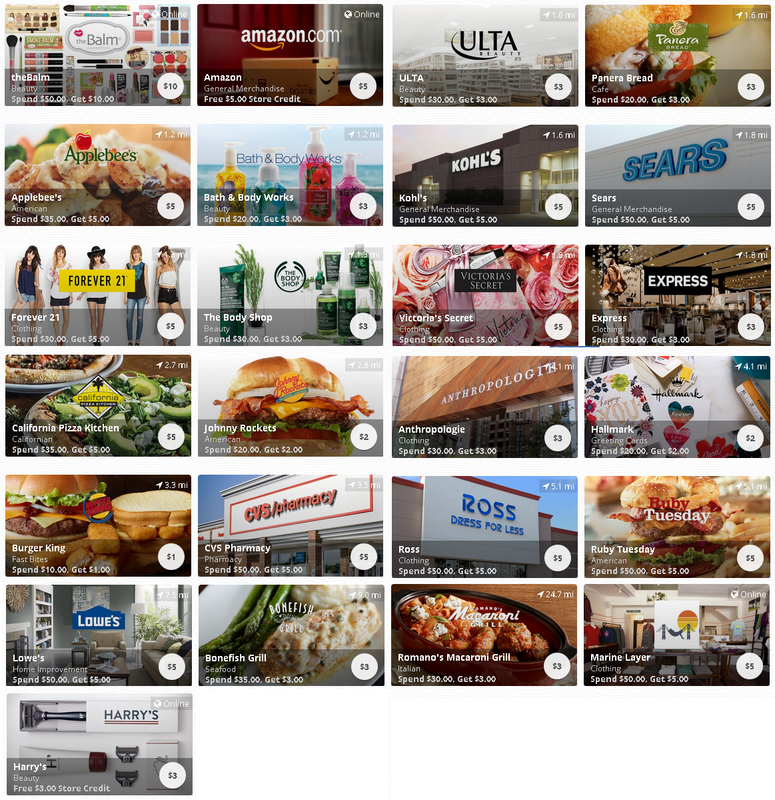 New Chime offer is available: $2 instant cash back for Amazon purchases. You can earn $2 cash back when you spend $2 or more. If you don’t know about Chime card, click here. It’s a no-brainer because you can redeem it by purchasing $2 Amazon gift card. If you want to use Amazon GC for yourself, just reload GC to cut the step of opening an email and copy&paste a code. 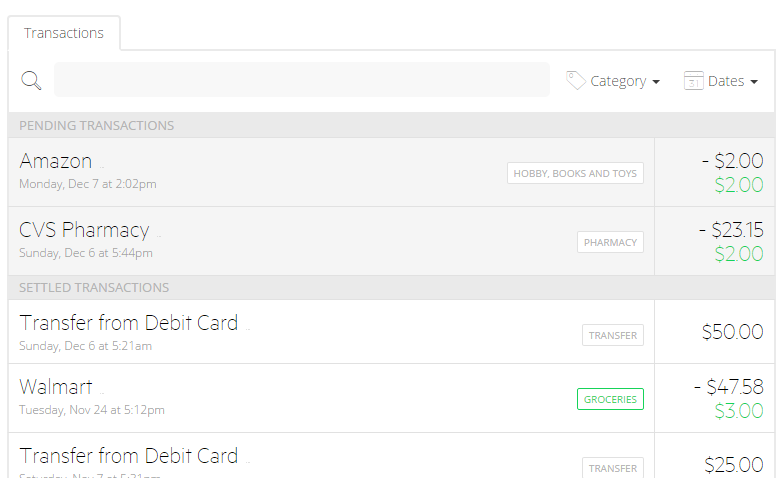 I remember I used Chime card and received cash back on Starbucks GC reload online. I checked the website today. The minimum for a reload is $10. 10%-discount on Starbuck GC is not really worth it. So, I will use it in-store by purchasing something cheap. There are many other offers for cable and auto insurance companies, H&M, Express, J.Crew, and CVS. CVS offer is $2 cash back on $20 or more spent, but you don’t have to spend that much on merchandise because CVS gives you up to $40 cash back at the register. 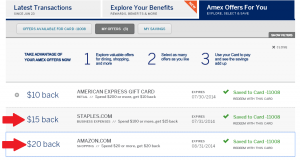 The offers of Amazon, Sears, Lowe’s, and CVS are redeemed by purchasing gift cards. And Amazon’s offer has no minimum purchase requirements. 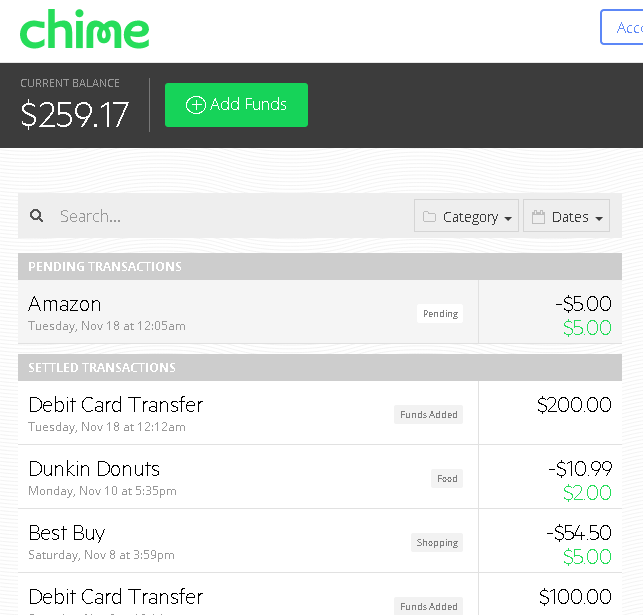 No matter how much you spend, you will receive Chime credit up to $5. If you spend $3 today and $10 tomorrow, you will get back $3 today and $2 tomorrow. But I think this offer is too good to be available for a long time. 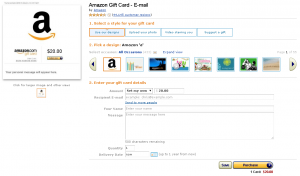 So, it is better to redeem now by purchasing “Amazon.com Gift Cards – E-mail Delivery.” You can choose an amount between $0.50 and $2000 in any increments. Just buy $5 e-gift card now otherwise the offer may be gone tomorrow. As for Chime app on my cell phone, it works fine after I cleared data and re-entered email address and password. I guess that there are too many new offers for the app to handle. I may be going to buy Amazon GCs at Sears, Lowe’s and CVS, too. Currently, there are 4th quarter of Chase Freedom, Citi divinded, and Discover credit cards (5% cash back.) Plus, Discover offers another 5% cash back in October and November. I’m very busy to buy a lot of GCs now! I received this offer in July 2014. 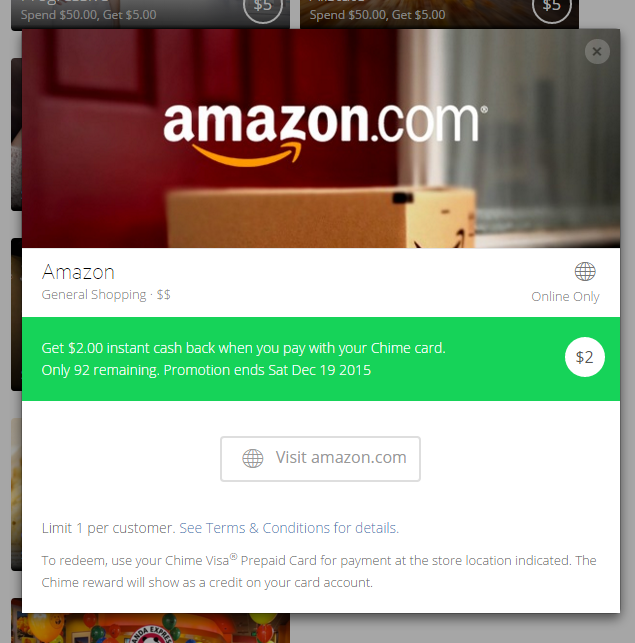 I purchased $20 Amazon E-Gift Card with AmEx card synced with this offer (Blue Cash Preferred). Usually, AmEx sends a confirmation email (picture below) in a minute, but I didn’t receive one this time. I purchased the e-gift card on July 10th, and the credit was posted on the next day. Since amazon gift cards are eligible items for this offer, just buy a $20 gift card for a future purchase if you don’t find anything you want right now. I purchased $100 Sears gift card with the card. For this purchase, I received a confirmation email (2nd picture) right after the check-out. Please note that Staples offer is valid online only, and e-gift cards are not eligible items. What generous offers! Thank you, American Express! I just found two new Amex Offers. Both of them are really great. They are both one-time deal on each card. I have two American Express cards, Blue Cash Preferred and Serve, but I don’t see these offers on Serve (facebook nor twitter). Please note that e-gift card purchase are not eligible for the offer at Staples.com. It’s clearly described on the top row of Terms. Here is the full description of terms. I appreciate that American Express clearly describes terms because purchasing e-gift cards was the first thing I came up with when I saw the offer. Plus, they usually send a confirmation email right after you use a card synced with Amex Offer. So even if you order something, but don’t receive a confirmation email, you should check your order and re-read Terms to see if your order is eligible for the offer. While e-gift card purchases are not eligible, physical gift card purchases seem to be OK. I plan to use this offer for either $200 Visa gift card (+$6.95 purchase fee) or $100 Sears gift card (+$1.99 shipping fee). As for amazon, it seems any items are OK. So, I purchased $20 e-gift card. But it’s been 12 hours since check-out, I haven’t received a confirmation email from American Express. E-gift card may be excluded from eligible items. But I will wait and see for at least a week. I don’t have to rush. The offer at amazon.com expires on the end of August. There is plenty of time.